These reactors are among the most efficient for photochemical reactions since the lamps are effectively surrounded by the solution to be irradiated. The lamps are contained in double-walled immersion wells made of quartz, allowing water cooling and/or filtering of excitation radiation. Various flask designs enable reactions to be conducted under anaerobic conditions at low or constant temperature. Two basic types of mercury lamps (low and medium pressure) are used. Low pressure lamps emit over 90% of their radiation at 254nm. Medium pressure lamps produce predominantly 365-366nm radiation with smaller amounts also in the ultraviolet region at 254, 265, 270, 289, 297, 302, 313 and 334nm. Significant amounts of radiation are produced in the visible region at 405-408, 436, 546 and 577-579nm. Lamp model 3040 may be operated at 600W output by using power supply Model 3142. This higher power has proved especially effective when used with the larger flasks volumes 1000ml and 2000ml. Arc sources possess negative voltage-current characteristics and conventional low-impedance power supplies cannot be used. Lamps must be operated from reactive-type supplies having a large resistance or inductance in series. This provides extra power to initiate the arc and reduce the power for continuous operation. Recommended power supplies for lamps are listed below. Input voltage 200-240VAC, 50-60Hz. Tests have been carried out to measure the rise in temperature on the surface of the immersion well with the cooling water circulating and a lamp operating. The cooling water temperature was 20°C in all tests. Ice was introduced into the cooling water, this only lowered the temperature on the surface by 5-10°C. The low pressure lamps were not tested because of their low operating temperatures. These are double-walled vessels made of quartz glass which house the irradiation lamp. Inlet and outlet tubes provide for air or water cooling. A PTFE tube extends to the bottom of the annular space to allow coolant liquid to flow upwards from the bottom of the well. A space between the walls allows filtering of certain wavelengths with liquids such as cobalt, nickel, copper sulphate, sodium nitrate solutions or gas such as chlorine to reduce secondary photochemical reactions of products. 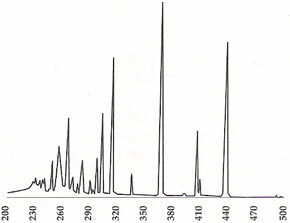 Three types of outer reaction flasks are available. 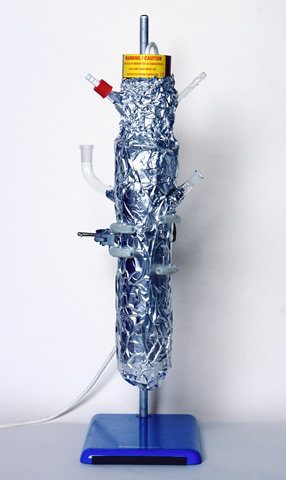 All are made of borosilicate glass and are fitted with one central ground socket to take an immersion well and other smaller sockets for a reflux condenser or drop-in funnel, sampling port etc. 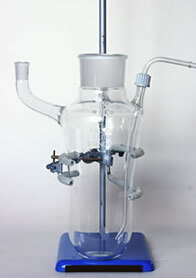 Flasks may be supported by conventional laboratory stands and clamps. These are cylindrical flasks with a partially flattened bottom for a magnetic stirrer bar. They are provided with one angle socket (10/19) and one vertical socket (14/23). PTFE tubing for gaseous agitation may be led through the 10/19 socket. This type of flask may be immersed in a container of liquid ice slush, etc. for low/constant temperature irradiations. The 1000ml and 2000ml flasks are fitted with one angle socket B14/23, one vertical socket B19/26 and SQ18 screw thread for gas agitation of reactant. These are similar to the standard flasks but have a sintered glass disc (medium porosity) fitted to the bottom of the flask to permit gas agitation and allow the reaction mixture to be kept under an inert or reactive atmosphere. A glass-PTFE stopcock is attached at the bottom. This type of flask is provided with two vertical sockets (14/23 and 10/19) and upper exit tube fitted with glass-PTFR stopcock. Two tubes are fitted at the base, one with sintered disc and glass-PTFE stopcock for use as a liquid entrance tube and drain tube. 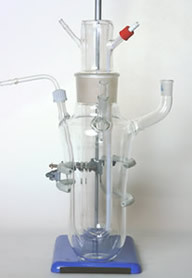 The inert pump used for the thin film reactor may be used with a reservoir to pump liquid through this type of reaction flask. Small quartz immersion well reactor components RQ125: Use small borosilicate glass immersion well 3220. Full details of liquid cut-off filter solutions are supplied with instruction manuals. 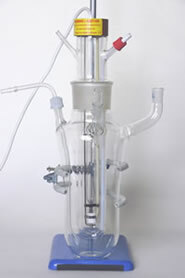 A double-surface reflux condenser, overall length 275nm with 14/23 cone joint, prevents “reactant creep” and loss of vapour when low boiling point liquids are used. This will fit all types of reaction flasks, excluding 1000 and 2000ml capacities. The following lists describe a number of reactor components, the combination included in each model having proved effective since the models RQ125 and RQ400 were introduced in 1976. Flasks with larger volumes are available on request.